Innovation promises to enrich the retail customer experience. However retailers must meet rising challenges to deliver these experiences securely. At EKN Research’s most recent retail executive dinner, senior Marketing, IT, and Loss Prevention leaders discussed this delicate balancing act. “I’ll Tell You Everything” – This customer craves the experience and emotional connection that comes with shopping at her favorite retailer. She rarely, if ever, thinks about security – expecting that someone else has it covered. She is trusting…especially with her favorite brands. Her expectations are high and , she demands relevance and service in exchange for her continued trust. “I’m Not Giving You Anything” – She pays in cash and won’t join your loyalty program. She’s disabled location services on her phone and doesn’t post to social media. She craves her privacy. Maybe she’s been burned before or perhaps she’s read about one breach to many. She won’t compromise privacy to get a better customer experience. In reality, most customers fall between these two extremes – so retailers must consider both. Now, let’s try to wrap our heads around the pace of innovation. New brands, concepts, products, services and experiences continuously evolve across web, mobile and store channels. The buzz from business and technical ideas is constant –personalization; customization; wearables; IOT; cloud; and more potential 3rd party partners and vendors than you can count! The rise of analytics and data-driven decision-making elevates the need to harden data security and integrity more than ever. External security concerns (many beyond a retailer’s direct control) include POS or credit card breaches, denial of service attacks on a retailer’s systems (or those of partners), competitive espionage, social or political activity, and more. Insider threats can be just as dangerous – shrink, leaks of sensitive non-public financial data, or the usage of unsecured technologies outside of corporate firewalls. And unfortunately physical security of both stores and home office locations for active shooter scenarios are now commonplace. The risk environment can seem daunting! But retailers cannot go into a shell and wait for these storms to pass. The pace of change and the need to stay relevant (and profitable) requires balance. How does one maintain the appropriate level of security while at the same time implementing new ideas and experience to engage customers? It starts with ensuring a culture of partnership. Loss Prevention and Security cannot be effective operating within a “cafeteria culture” – one where they are lucky enough to overhear about potentially risky initiatives while in line at the salad bar. These groups need to establish their position as a trusted advisor, where they are brought into the risk evaluation process up front to effectively articulate the risk probability and range of outcomes. Don’t collect or retain more data than you need. Extraneous information doesn’t help and if breached, only increases downside risk. Establish more than a purely subjective evaluation. Perhaps you’ve had a past event with a known financial impact that you can reference – or create a quantitative model that can predict ranges of potential outcomes. Understand your customer and your culture and use them to define your risk appetite. Value the expertise from all perspectives, but also ensure clear decision-making authority and accountability. Finally, ensure that the memorable customer experiences that you create are positive – you’ve either delivered on the emotional connection and needs of your customers or you’ve effectively avoided serious risks. And of course, keep your balance to avoid ending up on the front page for the wrong reasons! Last week I had the privilege of participating in a retail executive dinner focused on the following topic: “Measuring & Increasing Omni-channel Customer Profitability”. Over the course of several hours we discussed a number of perspectives and more importantly, challenged each others perceptions and experiences. The first question posed was “Do you believe that omni-channel customers are more profitable than single channel shoppers, and if so, how much?”. Responses from around the table ranged from “2 to 3 times more” to “15-30% more” and other generic, wide ranges. 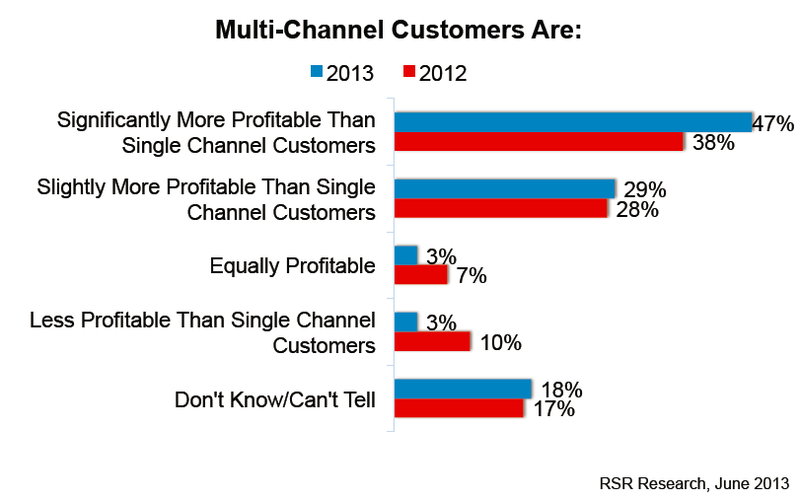 Essentially, everyone agreed with the RSR Research chart below, which shows that 76% of retailers agree that omni-channel customers are more profitable. But for most retailers, there is a different and more appropriate answer: “More Profitable / Don’t Know How Much”. To understand this response, we need to first define an omni-channel customer. A recent client (and many others) used this definition: “a customer is omni-channel if they have transacted across two or more channels within the last two years“. Sounds reasonable at first. A customer that buys online today and bought in-store last month certainly is an omni-channel customer, as is the catalog shopper who bought several items and returned some in-store (remember, a return is still a transaction). But the reason for this definition is rooted in the wrong place: the data. Retailers have data about customers (specifically, those that identify through loyalty programs) and transactions. So they can actually make this yes/no determination based on specific factors (at least one transaction in two or more channels within 2 years) within their data warehouse. The definition of the “omni-channel customer” should more appropriately be defined by Marketing. Uses third party mobile app (such as RetailMeNot or Shopular) and makes purchase on m.com site. Now let’s assume that these are the only purchase behaviors of these three customers. Are they omni-channel? By most data warehouse definitions, the answer is “no”. But clearly, the correct answer is “YES”. So if retailers lack the data to clearly identify a customer as “omni-channel”, will they ever be able to answer this question? It doesn’t matter…because the question itself is flawed. We know that omni-channel customers are more profitable. They are more profitable not because they are omni-channel…they are more profitable because they are ENGAGED with your brand, and because of that engagement, they leverage more touchpoints points to interact with your brand. So I’ll offer this updated definition of the ‘omni-channel customer”. In today’s connected world, all customers are omni-channel customers! Don’t spend time segmenting and analyzing omni vs. non-omni customers – focus on the customer attributes that matter to your brand. Figure out which customer segments might be more valuable and distort your customer experience strategies appropriately. Improve the customer experience accordingly (one of the two keys to a successful omni-channel strategy) and ensure that is is directly aligned and supportive of your brand strategy. Do so and you will increase engagement and value/profits. With most retailers investing in omni-channel capabilities in some way, stockholders, associates and customers are eagerly anticipating the future. A future where there truly exists a seamless bi-directional relationship between retailer and customer (my definition of omni-channel). Where every product in the assortment is available through stores, internet, or mobile and can be shipped in near real time from any location. And every customer activity, purchase, and behavior is known at both the individual and household level. But will this will be retail omni-channel utopia? Once all of our favorite retailers have these omni-channel capabilities, who will win? Certainly customers will appreciate the ability to purchase and return anything, anytime and anywhere. Customers are both rational and emotional. As a father of two pre-teen daughters, this is a combination of traits that even I might have a hard time grasping. But it is true. The logic side helps them find the best price and quality. It is a fairly clear scenario often with quantitative and definitive answers. And this is where the omni-channel capabilities come in. A retailer either has them or does not. They work smoothly or not. They make the transaction and buying experience easier or they don’t. And the rational customer will research every other competitor to find the best price, lowest shipping, or fastest delivery. And unless a retailer has the scale and resources to take on Amazon, this is going to be difficult. Those retailers who focus on the emotional side of the customer will have a better chance to succeed. Wow them with service. Create a memory. Do something for them that nobody else can. For at least a short time longer, the one advantage that every bricks-and-mortar retailer has over Amazon is their store. Use it! It is part of your brand and should be at the heart of your experience and customer engagement strategy. Make your store a destination. Give them an experience that they will never forget, an experience that they will want to do again, and an experience that they will tell everyone about! Define your Customer Experience Strategy…and leverage omni-channel capabilities to bring it to life. First let’s get the basics out of the way. Everyone must have standard omni-channel capabilities: buy online return in store; ship from store; buy online pickup in store; and so on. But once most retailers have these, none of them, independently or as a collective, will differentiate or enable competitive advantage. They will simply become table stakes. And if you don’t have them, with few exceptions, you are likely to lose. For those of you that have approved significant investments in these capabilities…don’t worry – it is not a sunk cost. It is necessary, but not the key. The key is analytics. There are very few guarantees related to an omni-channel initiative, but I’ll offer two. Fist, the initial implementation will not be perfect. Second, it will generate lots of data. Being flexible and adapting to customers, trends, external factors and more will be critical. Retailers must make decisions quickly and with fact-based data. Develop an analytics capability now…concurrently with your omni-channel initiative…and you will have the necessary information to make these decisions quickly based on facts. And more importantly, you will likely be 12-18 months ahead of your competitors who choose to focus on analytics only after they have completed their omni-channel initiative. So take a look at your omni-channel initiative and make sure that you are addressing the customer experience and analytics. Your boss will thank you, your shareholders will thank you, and of course, most importantly, your customers will thank you with repeat purchases and goodwill. Many retailers are currently struggling to understand how to define a strategy to effectively leverage advanced analytics. More so than the omni-channel imperative (which arguably is simply about keeping up with each other), there is a window of opportunity during which effective use of analytics can be a significant differentiator and a source of competitive advantage. In December 2013, Accenture released an outstanding research report, entitled “Seamless Analytics – Three Imperatives for the Retail Digital Marketplace“, where they state “the choice is clear: the digital marketplace is the future, and the decisive difference is analytics.” That assertion, as well as the three imperatives identified are spot on. However, there is one very important imperative that was missing…more on that later. But first, here are the three imperatives, with my insights added. “The Insights Imperative: Applying retail analytics to data for sharper customer insights.” – Retailers need to get a handle on their internal data and establish data governance processes to cleanse, manage and monitor the quality of their data. Most have shortcomings in their current data environments and this initiative can be long and tedious. It is important, but it is also not a complete impediment to leveraging analytics. The fact is that data will never be perfect and monitoring/cleansing will become a normal operational process. Measuring data quality and using quantitative methods to adjust for issues can be employed to enable effective analytics while data quality is being improved to acceptable standards. “The Actions Imperative: Turning insights into actions, at speed and at scale.” – Analytic insights must drive actions to be effective. Without a specific decision or action, analytics are merely interesting and not nearly worth the investment or attention. But once a decision point is identified, many retailers become overly reliant on their experience, instinct and gut. And for good reason…those are likely what has helped them be successful. But now with the availability of advanced analytics, decision-making is vastly improved. Consider the following equation: data + gut > gut. When you add an understanding of the data (assuming it was developed with a reasonable effort, cost and duration) to gut feel, the end decision is better than one made on gut feel alone. Those retailers that understand this equation will soon, and significantly, outperform those that rely on their historical methods. “The Outcomes Imperative: Focusing on business outcomes.” – To be truly transformational, analytics must be employed to support specific business outcomes and strategies. Once a retailer understands how they plan to differentiate, be it customer service, product quality, scale or something else, then metrics and analytics can effectively be employed to support the strategy. More metrics and more analytics are not necessarily better…but having a smaller set of the right measurements that support and drive the overall business strategy is imperative. And these metrics must become embedded in the ongoing operational mindset of the enterprise. The Missing Imperative – Leadership – In my opinion, this imperative is by far the most important, and without it, the value of analytics in the organization will be limited. Senior leadership, starting at the CEO and extending throughout the executive leadership team, must be strong advocates and active supporters of analytics. With that foundation, a retailer can change the culture from gut-driven to data-driven decision-making. Without it there is little chance of success. So the initial focus for any retailer must be on understanding these key stakeholders, educating them and confirming their commitment to analytics. Once this is accomplished, no small feat, then strategies and tactics around the other three imperatives can be defined and executed.